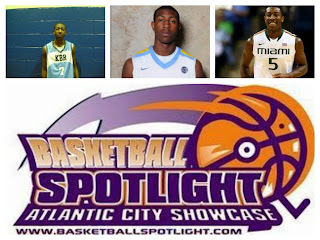 The Basketball Spotlight AC Showcase 8th Grade Michael Kidd-Gilchrist Bracket Schedule is listed below. Please make sure you are on time for all your games and bring the proper paperwork. ALL COACHES MUST CHECK IN AT THE MAIN HEADQUARTERS AT ATLANTIC CITY HIGH SCHOOL BEFORE YOUR FIRST GAME FOR COACHING PACKETS AND WRISTBANDS. EACH COACH MUST SIGN FOR THEIR OWN WRISTBAND DURING CHECK IN. ANY COACH NOT PRESENT WITH THE TEAM WILL NOT RECEIVE A BAND FOR THE WEEKEND. NO EXCEPTIONS. 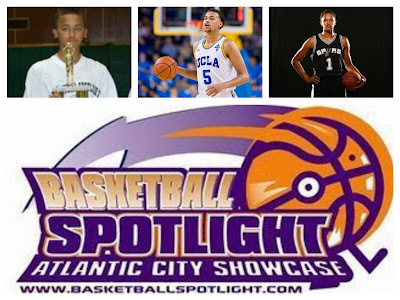 The Basketball Spotlight AC Showcase 8th Grade Kyle Anderson Bracket Schedule is listed below. Please make sure you are on time for all your games and bring the proper paperwork. ALL COACHES MUST CHECK IN AT THE MAIN HEADQUARTERS AT ATLANTIC CITY HIGH SCHOOL BEFORE YOUR FIRST GAME FOR COACHING PACKETS AND WRISTBANDS. EACH COACH MUST SIGN FOR THEIR OWN WRISTBAND DURING CHECK IN. ANY COACH NOT PRESENT WITH THE TEAM WILL NOT RECEIVE A BAND FOR THE WEEKEND. NO EXCEPTIONS. The Basketball Spotlight AC Showcase 8th Grade Dion Waiters Bracket Schedule is below. Please make sure you arrive early for your games and you possess proper paperwork. ALL COACHES MUST CHECK IN AT THE MAIN HEADQUARTERS ATLANTIC CITY HIGH SCHOOL BEFORE YOUR FIRST GAME FOR COACHING PACKETS AND WRISTBANDS. EACH COACH MUST SIGN FOR THEIR OWN WRISTBAND DURING CHECK IN. ANY COACH NOT PRESENT WITH THE TEAM WILL NOT RECEIVE A BAND FOR THE WEEKEND. NO EXCEPTIONS. 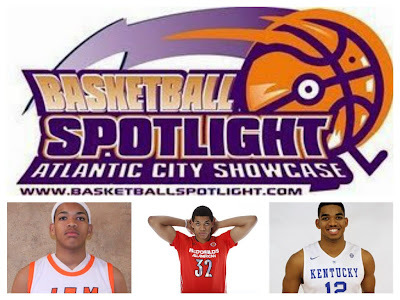 The Basketball Spotlight AC Showcase 7th Grade Karl Anthony Towns Bracket Schedule is listed below. Please make sure you are on time for you games and bring the proper paperwork. ALL COACHES MUST CHECK IN AT THE MAIN HEADQUARTERS AT ATLANTIC CITY HIGH SCHOOL BEFORE YOUR FIRST GAME FOR COACHING PACKETS AND WRISTBANDS. EACH COACH MUST SIGN FOR THEIR OWN WRISTBAND DURING CHECK IN. ANY COACH NOT PRESENT WITH THE TEAM WILL NOT RECEIVE A BAND FOR THE WEEKEND. NO EXCEPTIONS. The Basketball Spotlight AC Showcase 7th Grade Rondae Hollis-Jefferson Bracket Schedule is listed below. Please make sure you are on time for you games and bring the proper paperwork. ALL COACHES MUST CHECK IN AT THE MAIN HEADQUARTERS ATLANTIC CITY HIGH SCHOOL BEFORE YOUR FIRST GAME FOR COACHING PACKETS AND WRISTBANDS. EACH COACH MUST SIGN FOR THEIR OWN WRISTBAND DURING CHECK IN. ANY COACH NOT PRESENT WITH THE TEAM WILL NOT RECEIVE A BAND FOR THE WEEKEND. NO EXCEPTIONS. The Basketball Spotlight AC Showcase 7th Grade Amile Jefferson Bracket Schedule is listed below. Please make sure you are on time for you games and bring the proper paperwork. ALL COACHES MUST CHECK IN AT THE MAIN HEADQUARTERS BEFORE YOUR FIRST GAME FOR COACHING PACKETS AND WRISTBANDS. EACH COACH MUST SIGN FOR THEIR OWN WRISTBAND DURING CHECK IN. ANY COACH NOT PRESENT WITH THE TEAM WILL NOT RECEIVE A BAND FOR THE WEEKEND. NO EXCEPTIONS. The Basketball Spotlight AC Showcase 6th Grade Isaiah Whitehead Bracket Schedule is below. Please make sure you arrive early for your games and you possess proper paperwork. ALL COACHES MUST CHECK IN AT THE MAIN HEADQUARTERS AT ATLANTIC CITY HIGH SCHOOL BEFORE YOUR FIRST GAME FOR COACHING PACKETS AND WRISTBANDS. EACH COACH MUST SIGN FOR THEIR OWN WRISTBAND DURING CHECK IN. ANY COACH NOT PRESENT WITH THE TEAM WILL NOT RECEIVE A BAND FOR THE WEEKEND. NO EXCEPTIONS. The Basketball Spotlight AC Showcase 6th Grade Shep Garner Bracket Schedule is below. Please make sure you arrive early for your games and you possess proper paperwork. ALL COACHES MUST CHECK IN AT THE MAIN HEADQUARTERS AT ATLANTIC CITY HIGH SCHOOL BEFORE YOUR FIRST GAME FOR COACHING PACKETS AND WRISTBANDS. EACH COACH MUST SIGN FOR THEIR OWN WRISTBAND DURING CHECK IN. ANY COACH NOT PRESENT WITH THE TEAM WILL NOT RECEIVE A BAND FOR THE WEEKEND. NO EXCEPTIONS. 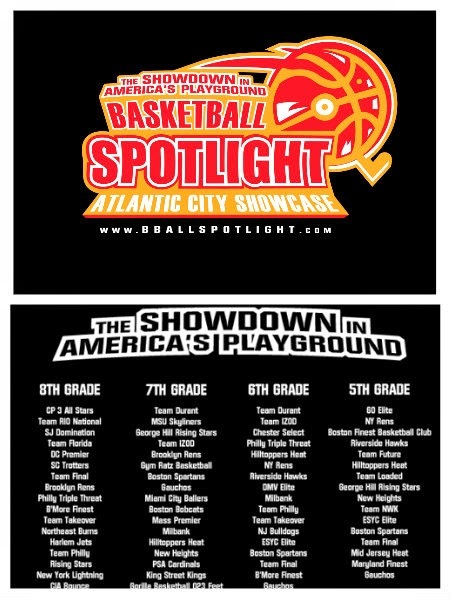 The Basketball Spotlight AC Showcase 5th Grade Davon Reed Bracket Schedule is below. Please make sure you arrive early for your games and you possess proper paperwork. ALL COACHES MUST CHECK IN AT THE MAIN HEADQUARTERS AT ATLANTIC CITY HIGH SCHOOL BEFORE YOUR FIRST GAME FOR COACHING PACKETS AND WRISTBANDS. EACH COACH MUST SIGN FOR THEIR OWN WRISTBAND DURING CHECK IN. ANY COACH NOT PRESENT WITH THE TEAM WILL NOT RECEIVE A BAND FOR THE WEEKEND. NO EXCEPTIONS. 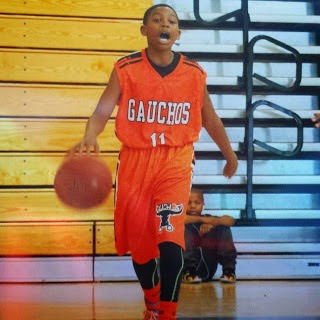 The Basketball Spotlight AC Showcase 5th Grade Isaiah Briscoe Bracket Schedule is below. Please make sure you arrive early for your games and you possess proper paperwork. ALL COACHES MUST CHECK IN AT THE MAIN HEADQUARTERS AT ATLANTIC CITY HIGH SCHOOL BEFORE YOUR FIRST GAME FOR COACHING PACKETS AND WRISTBANDS. EACH COACH MUST SIGN FOR THEIR OWN WRISTBAND DURING CHECK IN. ANY COACH NOT PRESENT WITH THE TEAM WILL NOT RECEIVE A BAND FOR THE WEEKEND. NO EXCEPTIONS. The Basketball Spotlight AC Showcase 4th Grade Malachi Richardson Bracket Schedule is below. Please make sure you arrive early for your games and you possess proper paperwork. ALL COACHES MUST CHECK IN AT THE MAIN HEADQUARTERS AT ATLANTIC CITY HIGH SCHOOL BEFORE YOUR FIRST GAME FOR COACHING PACKETS AND WRISTBANDS. EACH COACH MUST SIGN FOR THEIR OWN WRISTBAND DURING CHECK IN. ANY COACH NOT PRESENT WITH THE TEAM WILL NOT RECEIVE A BAND FOR THE WEEKEND. NO EXCEPTIONS. 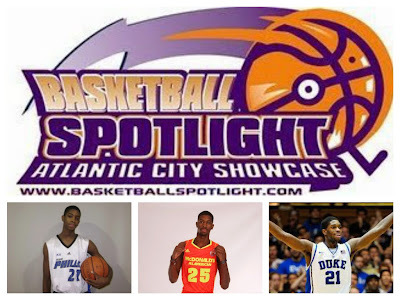 The Basketball Spotlight Atlantic City Showcase is so hot we decided to bring back our event t- shirts. The black t-shirt features the event logo on the front with the slogan “The Showdown In America’s Playground” with the team names featured on the back. This item will be guaranteed to sell out and will be on sale at the event headquarters which is Atlantic City High School. Be sure to stop by the event and grab you one. 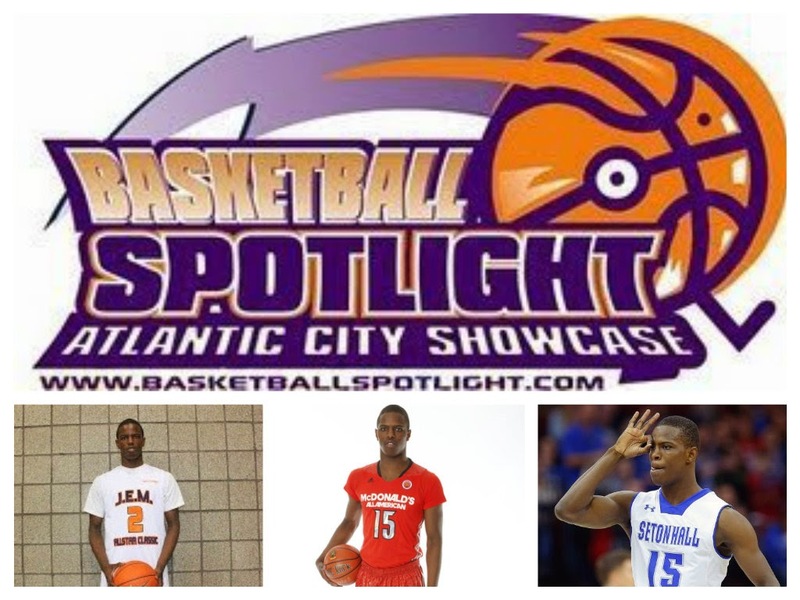 The Atlantic City Showcase will truly bring together the top teams in the country. 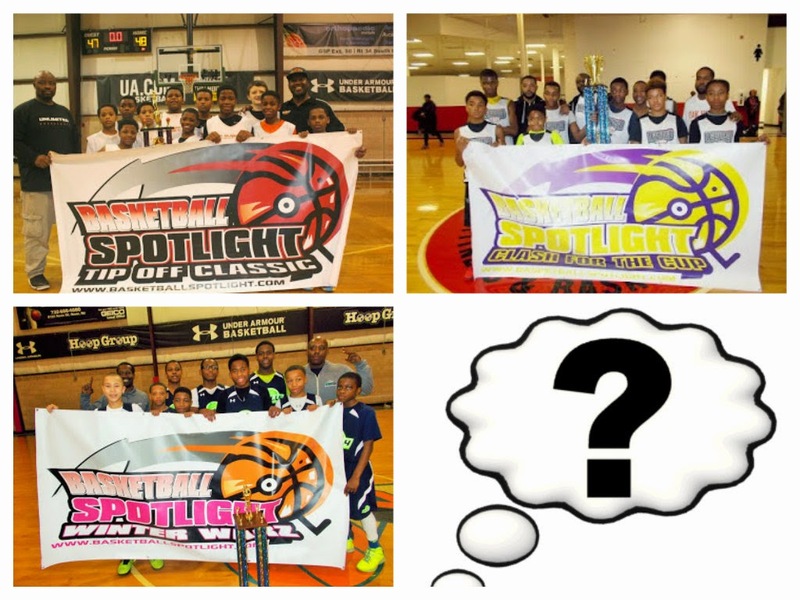 It also will give us a chance to answer serious questions about the AAU season. 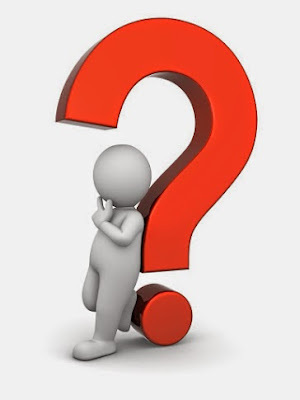 Here are a few questions that should get answered at the AC Showcase. 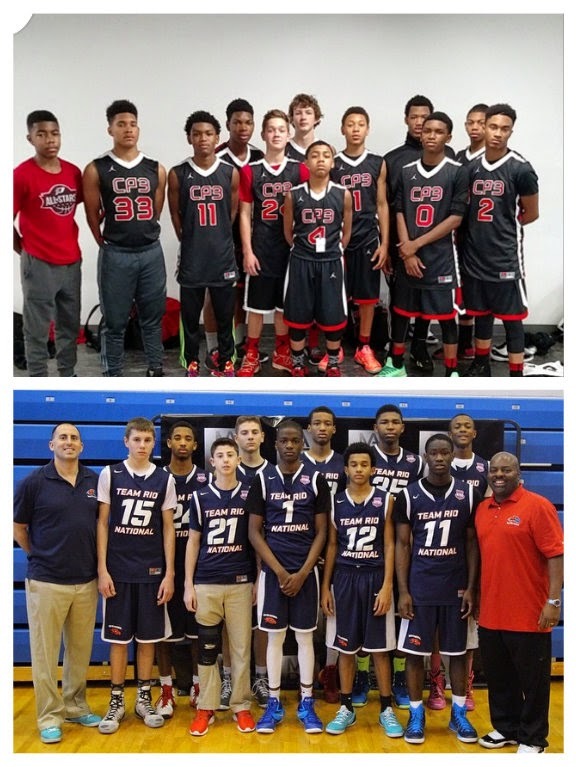 1. Who has the best 8th Grade Team in America? Yes since the AAU rule change and emergence of new leagues this will be the first time they true top teams in the country will be competing in the same event. You have CP3 All Stars the back to back national champions and Team RIO National which is the most dominant force on the east coast and have the ability to blow any team out. This should be a true heavy weight battle with the winner staking claim as the best squad in the land. Last year it was Supreme Team vs. WACG which turned out to be a classic. Can this battle live up to the hype? We will see Saturday at Atlantic City High School. 2. Who is the true #1 Player In The Country? Right now Rowan Barrett has the nod with most scouting services but he will be laying it on the line at the Showcase as Wendell Moore, Scottie Lewis, Bryan Antoine and Balsa Kopriva all will making their claim for the #1 spot. There’s a great chance one of these players could separate themselves from the pack or someone new could emerge. This is Atlantic City where something always seems to happen. 3. Is the Terror Squad Really Real? After storming through the first two Spotlight events, the Terror Squad caught their first loss in Winter Warz. After the loss rumors spread about players leaving and playing with other squads in different events. Now with the AC Showcase this weekend, will they regain form and dominate the competition or has the pack caught up to them. 4. What 6th Grade Team Will Take Control? Team Glory won Tip Off Classic, New World Unlimited Took home the Clash For The Cup and Philly Triple Threat was too much at Winter Warz. 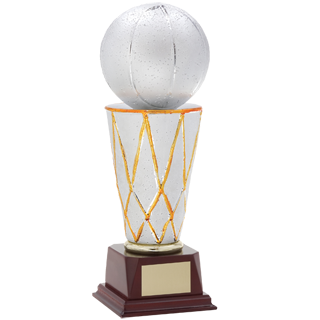 Now at the AC Showcase will we have a repeat champion or will someone else step up. Team IZOD is looking tough with the return of Trey Patterson and some other added pieces. I also think Team Takeover is capable of snatching their first crown. 5. 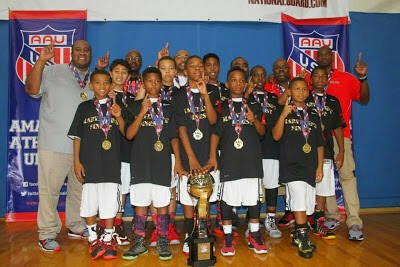 Is 5th Grade National Supremacy On The Line? 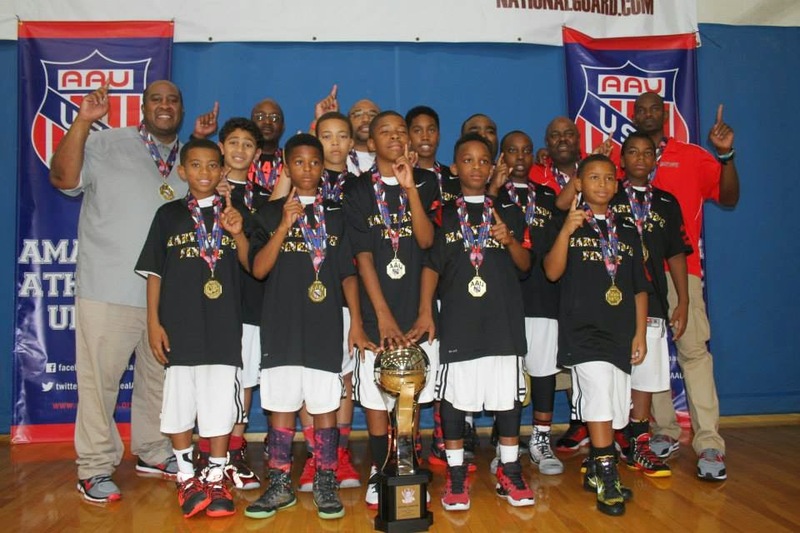 The 5th Grade Division also might tell us who the best team in the country is as we have the reigning National Champions in Maryland Finest, #4 George Hill Rising Stars, and #6 Gauchos of New York. 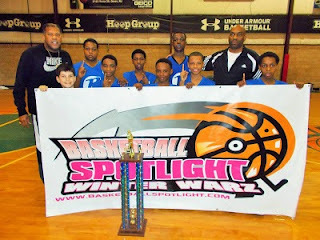 Standing in their way will be the NY Rens who just won Winter Warz and Riverside who is very hungry for a championship. Basketball Spotlight AC Showcase 8th Grade Preview: It's Money Time! Will The Jets Fly In Atlantic City? 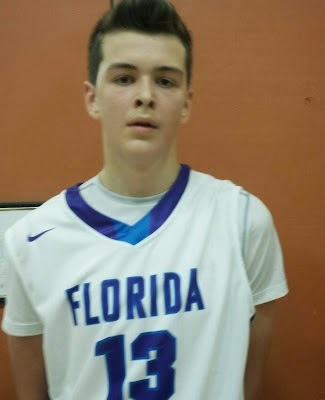 The AC Showcase 8th Grade Division has a ton of teams and loaded with talent. Since we talked about six of the teams in our poll we decided to take a look at some of the others headed to America’s Playground. 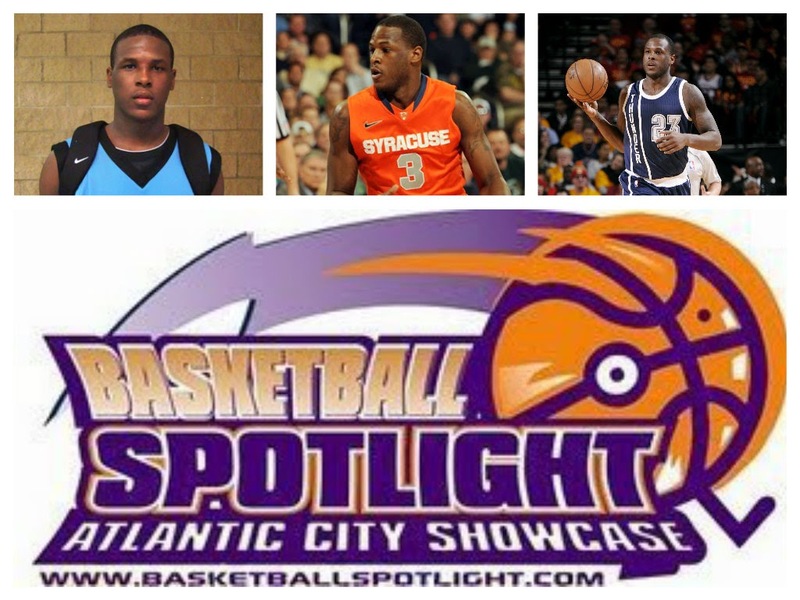 Harlem Jets: The Jets will be looking to get things done at the Showcase. Elijah Wenn and Adeleye OyeKanimi have put together great campaigns and when you add Glenn Anderson to the mix they only get better. They will be a tough out in this event. Team Final: TF will be making their Spotlight debut this season and will be hungry for a banner. Fahmir Ali has trimmed up and gotten quicker while Khyree Temple is ready to become a superstar. If Shawn Johnson can find his rhythm they could find themselves holding the banner on Sunday. 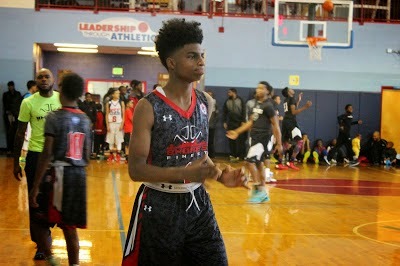 B’More Finest: James Bishop has proven to be one of the best scorer’s in the country. The lefty will have to score a ton of points for them to run the table in this division. If anyone is capable of doing it Bishop will be the guy. 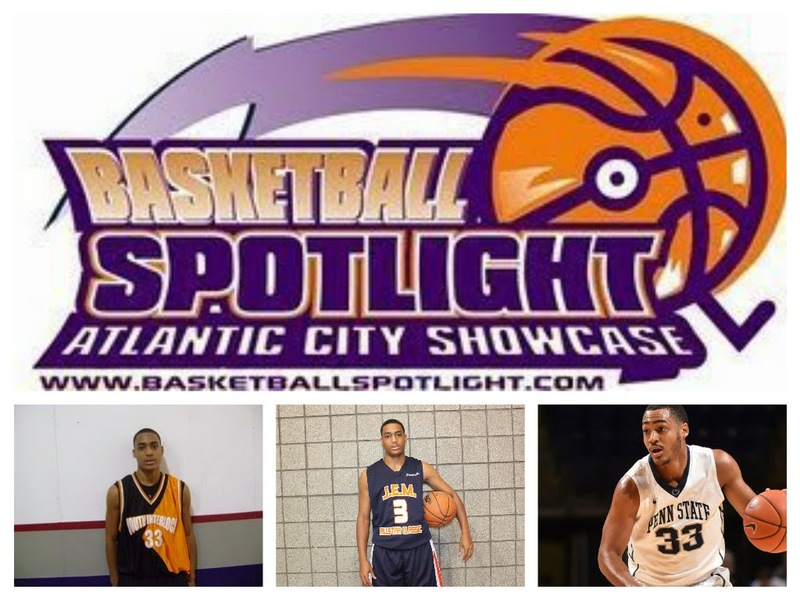 Philly Triple Threat: Jamil Riggins is back and PTT has benefitted greatly. If Dontae Scott can put together a couple of good outings they could make a run for the gold. 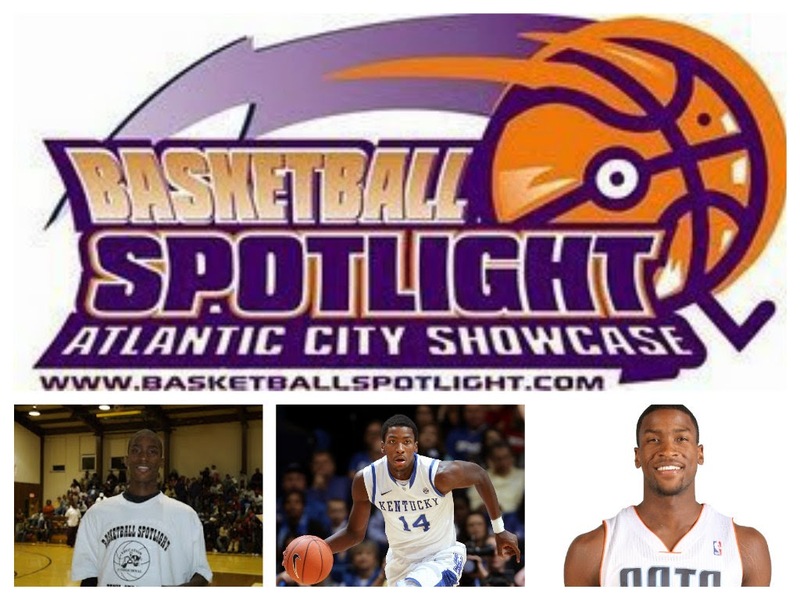 This group has always shown some success in Atlantic City. Newark Pharaoh: Papie Roberts is a tough as you can be at the point guard spot. 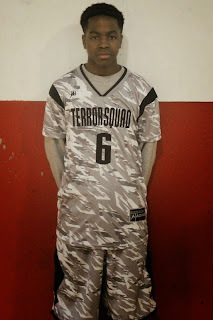 He anchors this squad from Brick City that has taken some of the top teams in the region down to the wire. Maybe Atlantic City will give them a chance to make the next leap. Play Hard: After having a low profile last season Mikeal Jones has returned and put his name back among the elite in the region. His play has lifted Play Hard from a Blue Division darling to an Orange Division threat. Team Bos: After spending a few events with Team Rio National Dyondre Dominquez will travel to AC with his hometown crew. The southpaw will be looked upon to carry the load but I also got word that they have another treat for us. 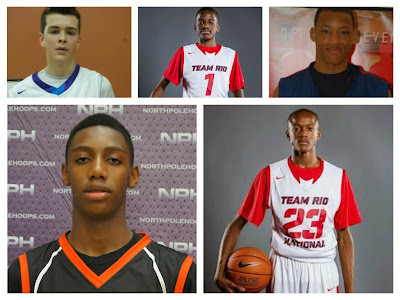 CIA Bounce: The Nike boys from Canada will also be making their Spotlight debut. They have shown some success in past Spotlight events. Hopefully they can put together some magic this time around. Basketball Spotlight AC Showcase 7th Grade Preview: There's No Where To Hide! Is Atlantic City Terror Proof? 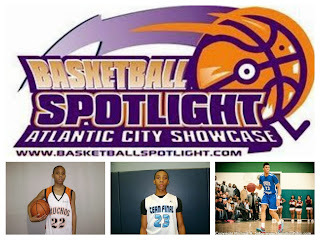 The Basketball Spotlight AC Showcase 7th Grade Division is loaded like no other in the country. From top to bottom this field will have no-where to run and should be a total dandy. Here’s a look at some of the top teams and players attending this event. Team Durant: The “Terror Squad” will be looking for revenge after taking their only loss of the season at Winter Warz. Their roster is loaded with the likes of AJ Hoggard, Tyler Brelsford, Cameron Byers and Jordan Toles. Will they turn back to their winnings ways at the Spotlight or tumble more? King Street Kings: KSK won Winter Warz after sending home the Terror Squad in the semifinals. They have emerging big man Elijah Everett alongside a mean backcourt in Zion Bethea and William White. They have a real good chance to keep their winning streak going. 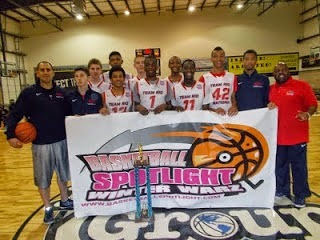 Team IZOD: Team IZOD looking to cross into the winner’s circle at Spotlight. 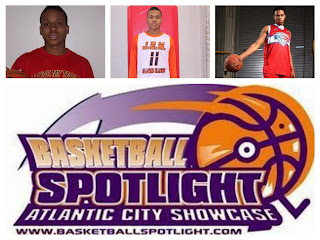 In Atlantic City they will be relying on the trio of Shane Dezonie, Qaadir Maneri and Richie Greaves. They have been so close in the past and maybe they can reach pay dirt in AC. PSA Cardinals: Another squad that came close to winning it all has been the Cardinals. Jaylen Murray and Posh Alexander give them a chance to knock off anyone. Their trapping style will be very useful against some of the top teams in the country. Gauchos: The Alphabet Boys are back for that crown. RJ Davis, CJ Robinson and DJ Bailey will be controlling the backcourt. When they get clicking they can score buckets in a hurry. It will be interesting because they have some serious competition in their pool. George Hill Rising Stars: The defending champs have to be looked at as one of the favorites. Their backcourt boast the trio of Hunter Jackson, Mike Saunders Jr. and Brevin Jefferson. They return to this event with a wealth of experience playing in this atmosphere. DC Premier: The Potomac Valley squad came close to winning the Clash For The Cup. Mike Sumners and Tejohn Ford handle the backcourt duties while Woody Newton will be a name you will want to know very soon. 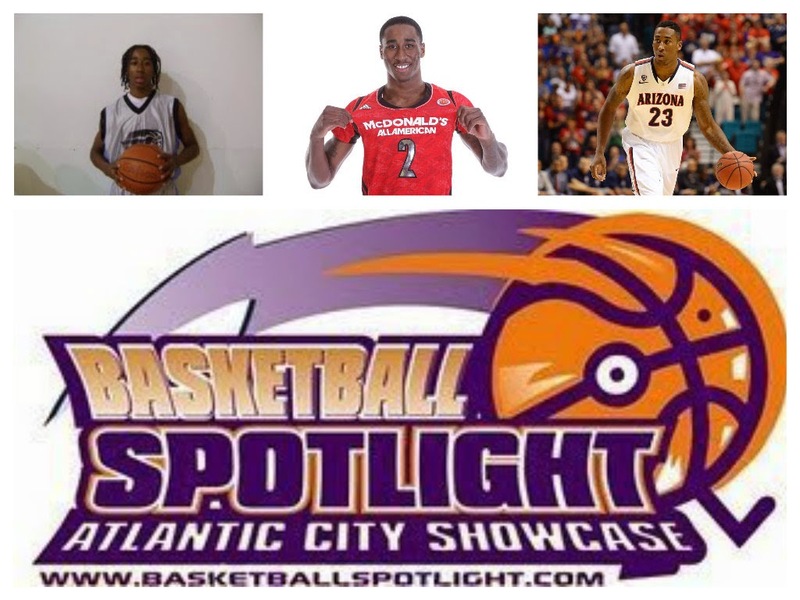 Worldwide Wildcats: Jalen Cone broke on the national scene at the Spotlight Future Phenom Camp and now will be ready to show his work in Atlantic City. I’m anxious to see super athletic guard Dwon Odom. This group should be a great addition to this super packed event. Team Takeover: Point guard Canin Reynolds apparently got a boost as big time forward Terrence Williams will reportedly suit for this event. As previously stated Williams is a walking double-double and arguably the country’s most dominate force on the 7th Grade level. His presence alone gives them a chance to win it all. Team Charlotte: Tristan Maxwell and Trayden Williams are a duo to reckon with for this Carolina squad. 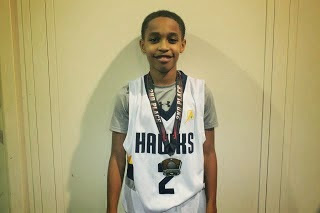 Maxwell showed his worth at the Future Phenom Camp and will be looking to raise his stock nationally. This event will be a true test for him and his teammates. RIP City: Last year Kieves Turner used this event to put his name on the national radar and now he will be trying to win it all. I hear Andrew King has taken his game to another level. If this is true then The PA boys will have a chance to advance in this sea full of sharks. Miami City Ballers: This will be our first look at this squad but Greg Tejadi informed me that he will be brining 6’9 Ebenezer Dowuna from the Republic of Ghana. Knowing Greg a Spotlight coaching legend, he wouldn’t travel this distance without bringing some heat with him. The Basketball Spotlight Atlantic City Showcase has become the #1 middle school event in the country and it took us a few years to get to this point. Here’s a look back at our promo video which help take this event to another level. We would like to thank all the players and fans for their support. See you guys at the AC Showcase. 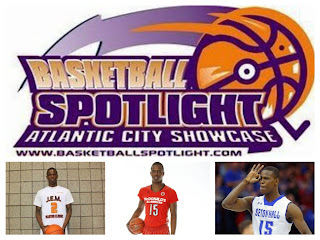 The Basketball Spotlight Atlantic City Showcase is once again shaping up as the “Event Of The Year”. This year we will be honoring past great alumni by naming divisions after them. This is our way letting the future basketball stars know who came before them and also letting the alums know that we honor and appreciate their past endeavors. As the AC Showcase add more features we will keep you guys posted. Basketball Spotlight Fan Poll: Who Will Win AC Showcase 8th Grade Championship? 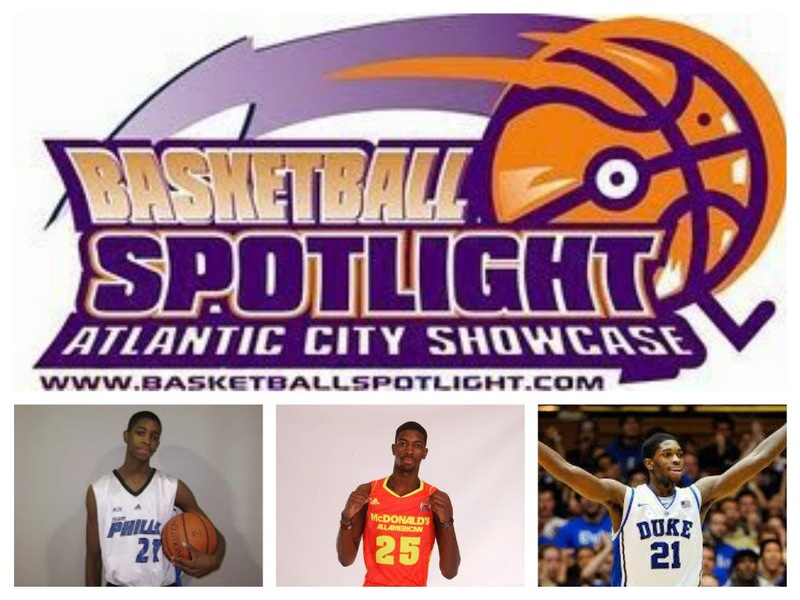 The AC Showcase has once again turned into the event of the year and Basketball Spotlight would like to fans to help us with a big question. 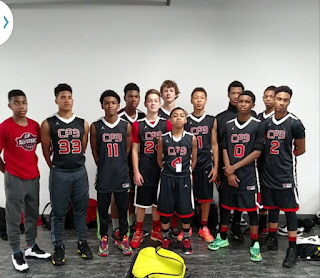 The 8th Grade Division has the top teams in the country and we wanted you guys to predict the winner. Here are the Top 6 teams below and your chance to vote for the winner. CP3 All Stars: The two-time AAU National Champs will be making their AC Showcase debut with a loaded roster. The Langley twins along with Mike Green controls the backcourt. While Wendell Moore arguably the top player in the shows his versatility. Newcomers Myles Pierre and Christopher Hinton might take this team to another level. They could be the overwhelming favorite. 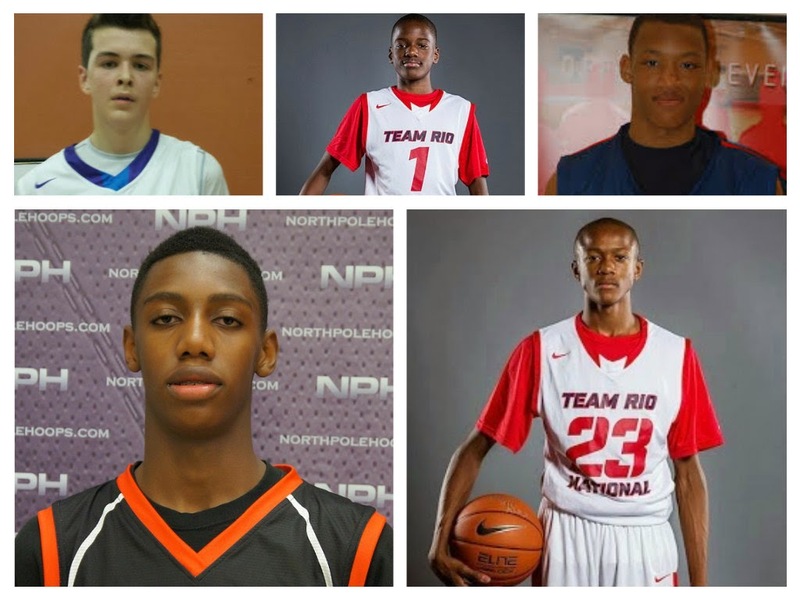 Team RIO National: Rio enters AC Showcase wanting a shot at the champs. 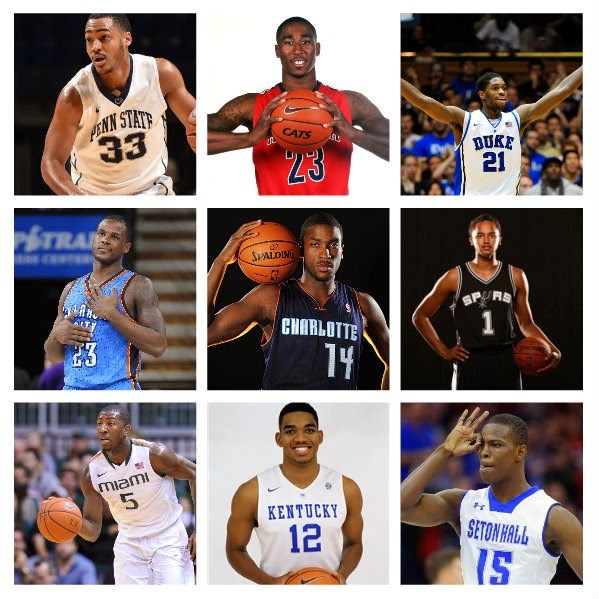 They have been steamrolling the competition all year and possess one of the best rosters in the country. Bryan Antoine, Scottie Lewis and Tariq Ingraham could be considered 8th Grade All Americans while Jalen Gaffney has emerged as one of the top guards in the region. When they are clicking they are virtually unbeatable. DC Premier: Premier is another loaded bunch featuring the Mitchell twins (Makhi and Mahkel), along with scoring guard Marvin Price. If Christian Depollar shows up they have a great chance to run the table. Coach Perry is ready to show that his boys can not only compete but defeat the top teams in the country. 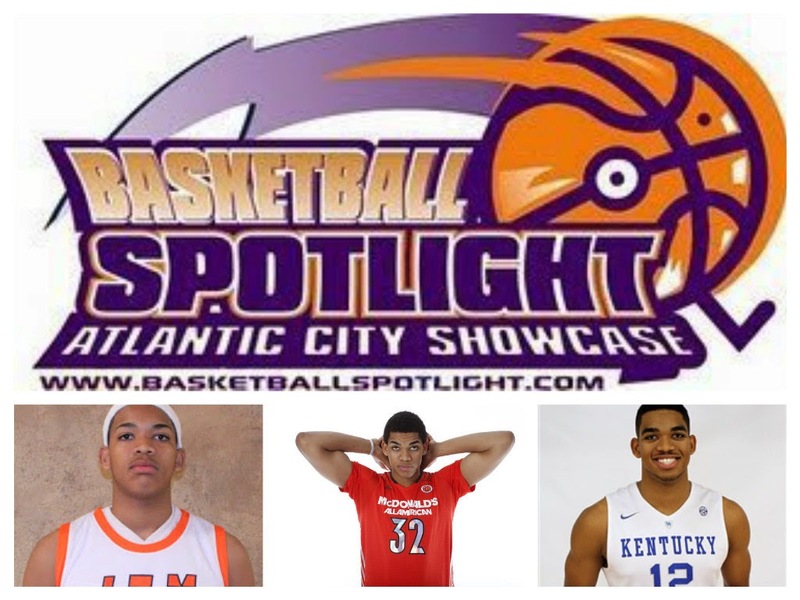 Team Takeover: Yes TTO finally made it to the Spotlight and picked the right time to do it. 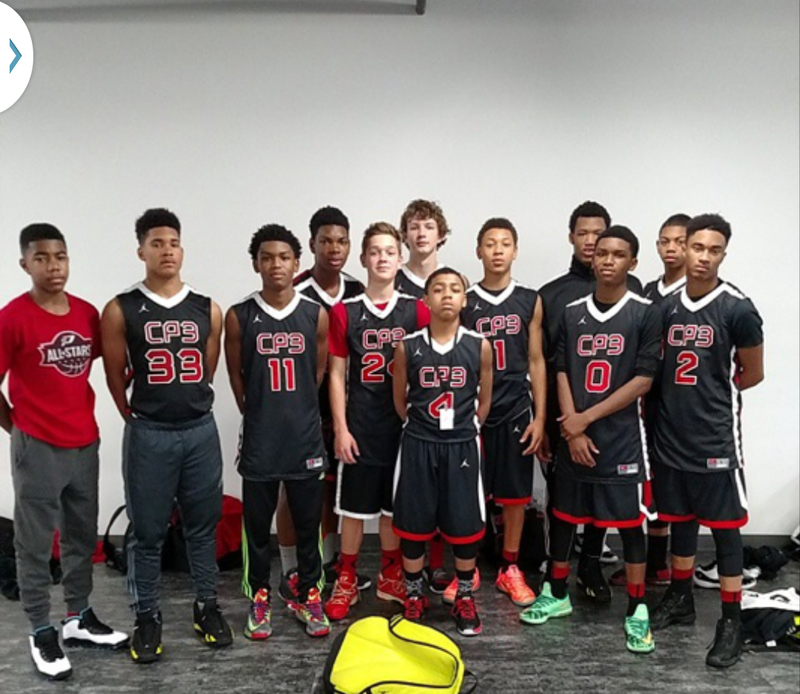 They are stacked with scoring guard Justin Moore, dazzling floor general Jonathan McGriff, reliable 7th Grader Terrence Williams and emerging big fella Hunter Dickinson. It will be very interesting to watch them tangle with the best. On Sunday they could be holding the banner. Team Florida: Balsa Koprivca and Bryan Sanders make up one of the best tandems in America and they will be leading Team Florida into their Spotlight debut. The deck is stacked with the top teams in the country and can the boys from the Sunshine State get it done? We will see April 4th and 5th. Team Ennis: The field wouldn’t be complete without the #1 Player in the Country. 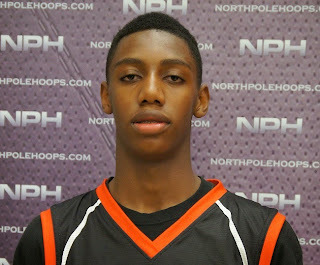 Yes Rowan Barrett will lace them up at the AC Showcase. The competition will be fierce but this talented southpaw has the ability to take the game over at any time. Can he put the Canadian squad on his back and take the title back across the northern border? This 8th Grade field is stacked and wide opened make sure you cast your vote in the top right hand corner.